This week it gives me great pleasure to introduce you to Elizabeth from Rustic Maple. Elizabeth is an over the border Canadian blogger friend. Love that she said yes to doing Spotlight. Please take some time and read and get to know Elizabeth. Then hop over to her wonderful blog and say Hi. Hello everyone! I'm Elizabeth at Rustic Maple and I am honored that Kris has asked me to be in the Saturday Spotlight. I have been following Kris and enjoying her beautiful blog and home for some time. I have met some awesome people through blogging and am continually inspired by the creative ideas and glimpses into blogger's homes around the world. My little blog began in 2009 as Blue Clear Sky but changed to Rustic Maple last year when I bought my own domain. 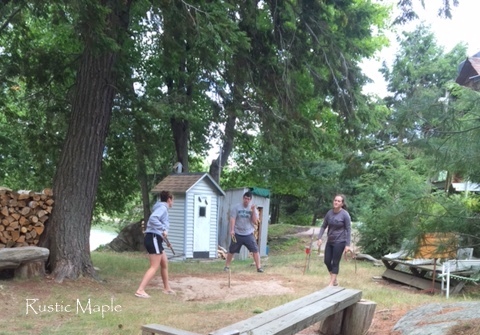 I chose Rustic Maple for my blog and business name because we enjoy spending time outdoors in Ontario, our beautiful province here in Canada. I will share more about my blog in a bit. Since I am here to "spotlight the real life behind the blogger" I guess I should share more about myself. I celebrated my 50th birthday this year and my husband Robert and I have been married for 23 years. We live in Halton Hills, a small town about an hour west of Toronto. I am blessed to have a kind and loving husband and two wonderful boys. Kyle is 18 and starting an apprenticeship and Josh is 16 and in grade 11. Up until this year, our boys had been involved in 4-H for many years showing dairy, beef, rabbits and goats. Even though we live in town, our oldest has a passion for agriculture. He sold his pair of goats and show rabbits last year but still owns Jersey dairy cattle (since we live in town he keeps them at my husband's cousin's dairy farm about two hours away.) 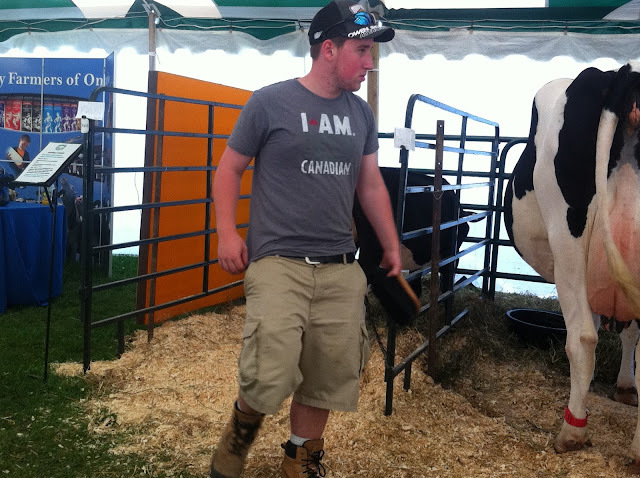 This weekend is our town's Fall Fair and Kyle takes care of the animals in the Agricultural Awareness tent for the three days of the fair. Josh helps him and they sleep in the tent overnight for the care and security of the animals. Josh is our fishing and sport-loving guy. He especially enjoys hanging out with his older brother. 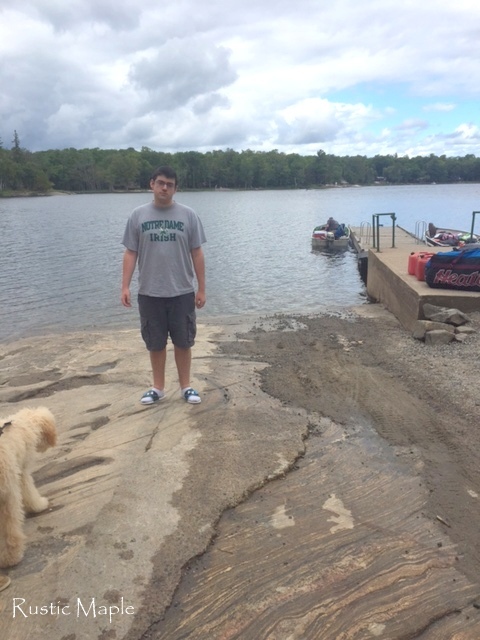 At 16 1/2 he is already 6'2" (photo at my bil's lodge/hunt camp in northern Ontario with my sister's family's 5 month old Labradoodle puppy, Scout.) This year Josh got his driver's license and his boating license. Josh is saving for his own truck (his brother saved and bought his own truck when he was 17.) We now wish that we had the forethought to plan for a driveway with four vehicles (including two big Cummins diesel pick up trucks!) 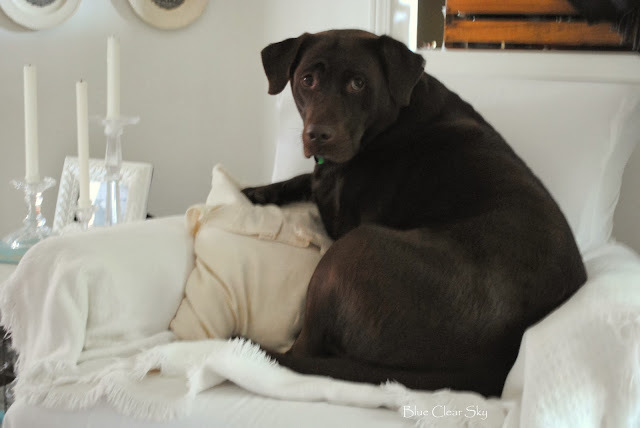 when we bought this suburban builder home 17 years ago..
We love our 5 year old female chocolate Lab, Remington. She is such a sweetheart! I am the second youngest of eight children and became an aunt when I was five. Our large extended family is a very big part of our life. I am very proud of my 17 nieces and nephews (plus spouses) and so far I have 19 great nieces and great nephews (not including hubby's side with 7 nieces/nephews and 2 greats.) Most of our social time is spent with family. We are especially close (and neighbours) to my youngest sister/best friend, her husband and their three children. We live two streets apart and the kids attended the same schools. I trained as a Practical Nurse in college and after 5 years in patient care I had an opportunity to work in a high school special education program, where I just reached my 25 year milestone. So back to my blog. I have always enjoyed creative hobbies and decorating. I get excited about paint, decor and hardware stores. Our home is always evolving as I work towards my preferred decor style and adding more character to our home, all on a fairly tight budget. My mind is constantly swirling with ideas for new vignettes, dreams of new pieces to make or how to change what I already have affordably. 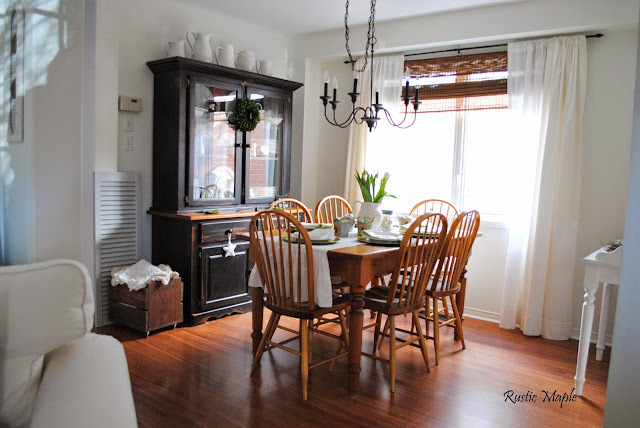 Over the past year or two I have focused on defining my decor style. 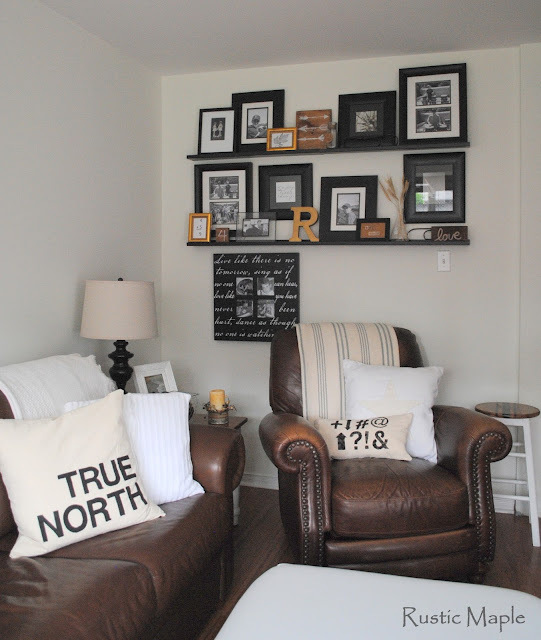 I like to decorate our home in a more rustic casual style that has influences of growing up on a farm (for my husband) and cottaging and camping near a lake every summer (for me), both of which we have made sure our sons experience. 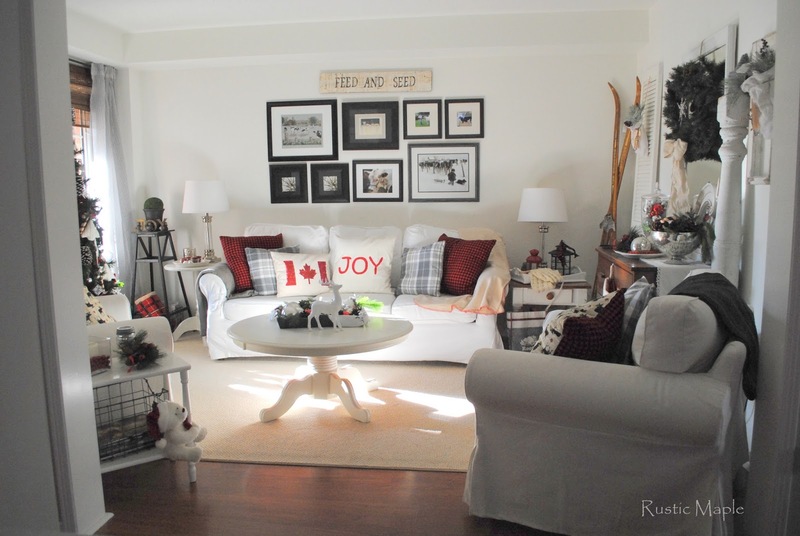 Speaking of seasonally, one of my favorite things to do is decorate for Christmas. I plan ideas throughout the year and love getting out all my organized clear bins. Then I do my sister's decorating! I paint furniture, DIY, do all of our interior/exterior painting, sew pillows (and quilt when I have time), knit, crochet and generally get crafty when the mood strikes. I make extra money for my projects by painting and selling furniture, and occasionally my stitched goods. One thing that I have learned from this experience of sharing 'the real life behind the blogger' is that I need to spend more time taking photos of myself (and making sure the ones of me look good haha!) We get busy and tend to rely on quick iPhone photos at gatherings. 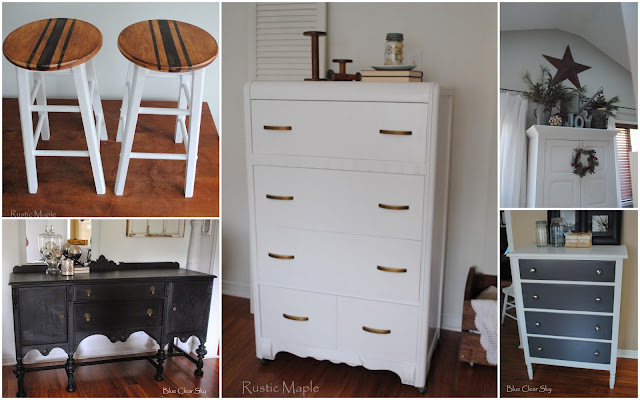 I would love for you to stop by Rustic Maple and say hello. 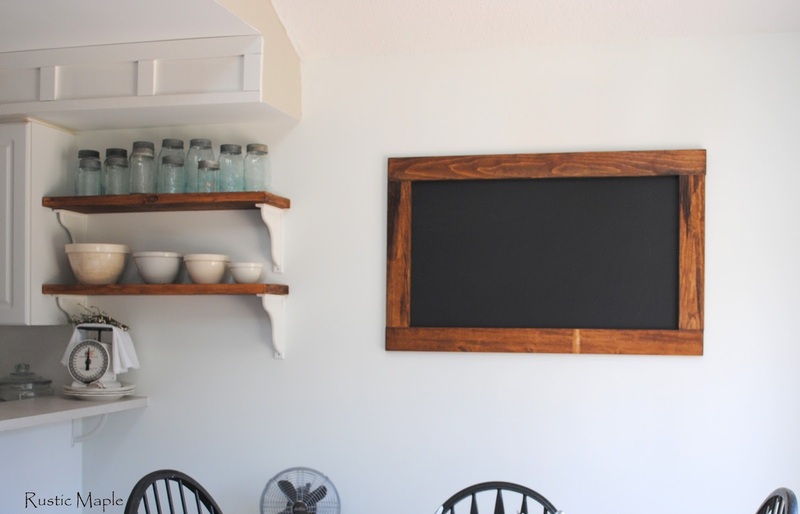 You can also find me on Pinterest as Rustic Maple Elizabeth Ramage and on Instagram as rusticmapleelizabeth. Thanks so much, Kris, for inviting me to share here today! Thank you Elizabeth for sharing about your hubby and son's and cute Remington. You have a beautiful family and I loved reading about you, your family and what blogging has meant to you. Have a great Saturday Every One! Wonderful to meet Elizabeth! We have one thing in common - 16-year old tall sons! Heading over to say hello at Rustic Maple! Enjoyed the quick tour of Elizabeth's life. Always fun to see someone behind the scenes. Nice to meet you Elizabeth, and your family! Your home looks very cozy and I envy your large family! Hello Elizabeth, your home look's lovely !! I'll be hopping over to your blog to check ya out !!! Thank you Kris, some of my favorite blogger's I follow come via you !!! Thanks Tammy for your sweet and kind words and prayers for us. Hopefully soon things will begin to turn around for us. Terry is working hard at this job hunting. Hope his efforts and hard work and expertise will land him a job soon. Thanks for coming by for Elizabeth today. Tammy thank you always for your visits and comments. I just do not have a way to email you back so I hope you come by today and read this. Nice to get to know you a bit better Elizabeth! Thanks for sharing this Kris - happy weekend girls! p.s it's down right cold here today.Brr. Nice to meet you Elizabeth and see your home and family! Thanks so much, Kris, for having me in the Spotlight today! You are such a kind and generous person and I always look forward to seeing what you are up to. I know this is a time of transition for you both and I am keeping you in my prayers. Thanks to your readers for their very kind comments as well. I was confused about the blog name, but now I understand why. If the rain continues in Philly we're going to need to buy a boat ... Hurricane not making a direct hit on the coast line but days more of continued rain and high winds, YIKES! Enjoyed reading about Elizabeth. Elizabeth you have a lovely family, including your chocolate adorable fur kid. I see you enjoy handcrafts and your home is pretty. Have fun today in Spotlight. Oh I love this post and this feature. One of my favorites for sure. Will have to travel that way. I've been following Elizabeth for quite some time but never knew much about her family. Thanks for featuring her, it's nice to read more about my favourite bloggers! I am a follower of your blog and it is nice to learn more about you. Thanks Kris for featuring her. It's always fun to make a new friend, Kris! I come from a large, close knit family too. I was 12 when I first became an aunt and am already a great aunt to two beautiful baby girls...we have a lot in common. On my way over to say hello to Elizabeth. Have a great weekend. 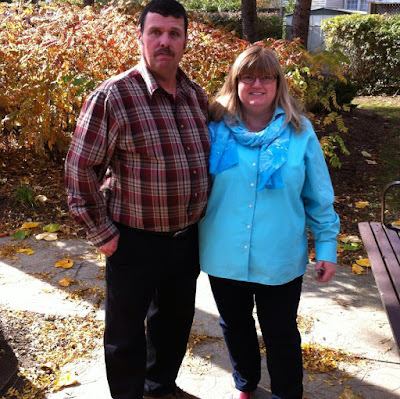 Thanks again, Kris, for featuring another great blogger! 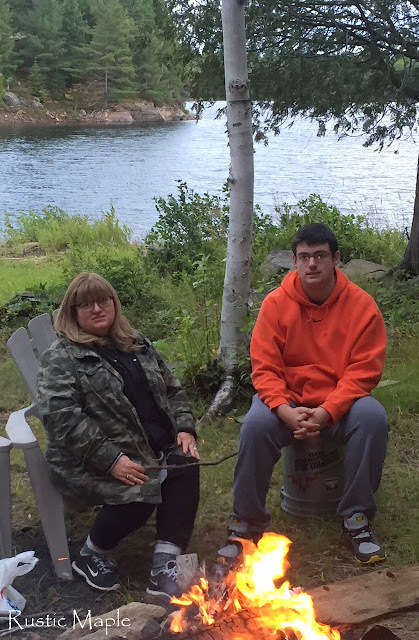 Elizabeth, my former sister-in-law and her family have always lived in Guelph, facing the lake. 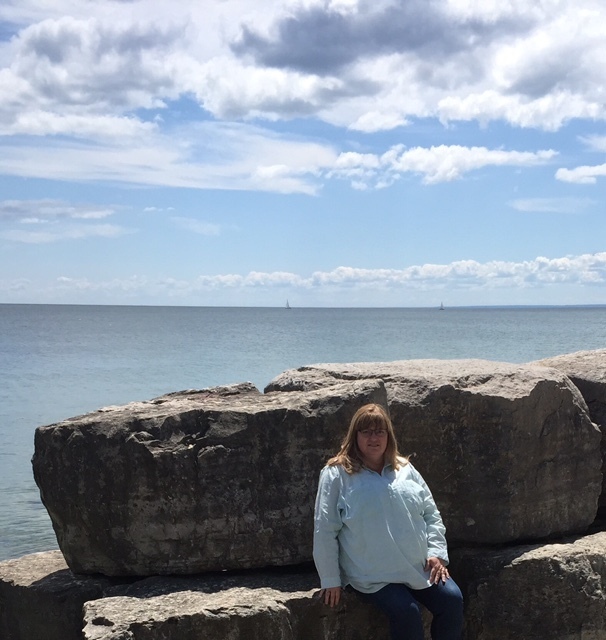 My former in-laws had a cottage over at Crystal Beach where they spent a great deal of time.I always thought that area was beautiful! It's nice to get to know more about you! 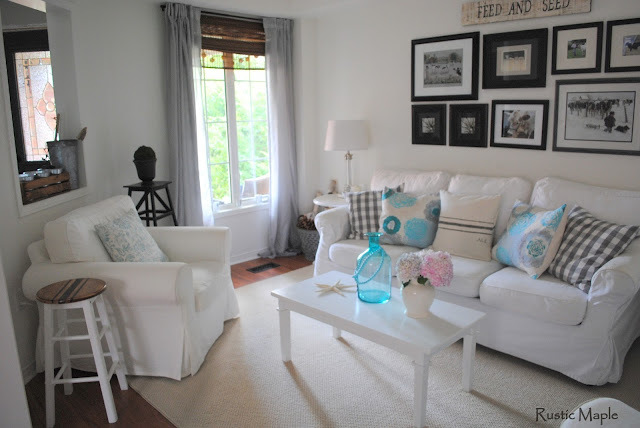 I follow Elizabeth...love her blog and home! It was nice to get to know her better here today. Thank you for featuring her on Spotlight, Kris. Great to get an opportunity to "meet" Elizabeth in more depth.....I'm already a follower of her lovely blog, and didn't know she came from such a large family! That is wonderful -- family is everything. I have just recently started following Elizabeth. We both live in beautiful Ontario! I love her decorating taste and enjoyed learning so much more about her family life today. Thanks for featuring her on your Spotlight today, Kris. What a lovely post and thank you for sharing these special parts of your life with us. Your home looks so lovely and welcoming. I'm popping over to Rustic Maple now to say hello! Thank you Kris for finding another interesting blogger for us today. Ahhh, always good to meet a fellow Canuck blogger. Kris, thanks for introducing us to Elizabeth! Heading over to Rustic Maple next. I love hearing stories about big families who love each other and spend time together. Thanks for featuring Elizabeth! I'll mosey on over and introduce myself.